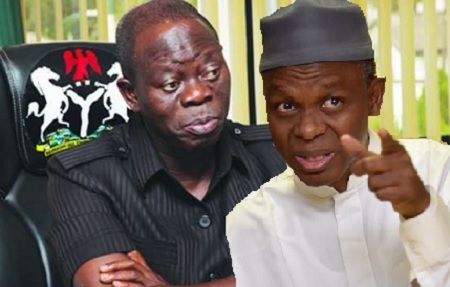 Some aggrieved Governors and members of the National Executive Committee of the ruling All Progressives Congress, APC have reportedly engaged in a secret move to call for the dissolution of the Comrade Adams Oshiomhole led National Working Committee, NWC. The Governors and the party chieftains are bent on stoking crisis in the All Progressives Congress, APC over the use of direct primary in the selection of the party’s candidates for elections. The group reportedly being egged on by a few governors with a two-term southern governor in charge had scheduled to hold a meeting for Sunday afternoon at the Transcorp Hilton Hotel Abuja. The principal aim of the meeting is to call for the dissolution of the Comrade Adams Oshiomhole led National Working Committee, NWC. The southern governor who is championing to have his son in law as his successor according to Vanguard is mobilizing to truncate the party’s decision on the use of direct primary as it could jeopardize his succession agenda and also truncate the governor’s own plan of proceeding to the Senate. Members of the National Executive Committee, NEC who do not belong to the NWC it was gathered were those being mobilized to canvass for the dissolution of the Oshiomhole led NWC. “The president has stepped in and warned them to clear off,” a senior party source said on Sunday morning in response to the brewing crisis in the ruling party. The president who is traveling in China was believed to have given the directive by phone to some of those pinpointed as being involved. Though a number of governors and a powerful minister were believed to have been sympathetic to the indirect primary, it was learnt that a number of them were already backing off from the rebellion. “The NWC will resist any attempt to disrupt the current peace and harmony prevailing in our great Party after the exit of some members of our Party. “We urge any member who is not satisfied with the decisions of the Party to utillize channels provided by the Party’s constitution to air their views.